Recommended, even if you don’t think you have problems! This book has helped us out so much. I'm a mother of 3 lovely, lively sons. I just could not believe that simple things like gravy or ****’s bath foam can affect children’s behaviour! I was dubious, but gave this book a go and lo and behold, its really worked. Its my new best friend! Unbelievable! I always thought my children were pretty good. Sure, bedtimes could have been easier but that's kids right? Always stalling for 5 more minutes or giving me "But muuuummmm....!". Taking a long time to faff around, the littlest one crying and not going down, the eldest waking stupidly early and thus the rest of the household. Evenings were getting wearing. I read this book, and I change ONE thing. Within 2 days I had the kind of bedtimes you only see on The Waltons! My eldest now gets herself sorted, and coming down to say to me proudly "Look, I'm in my P.Js and you didn't even have to tell me!" and my youngest doesn't create QUITE as much. It didn't cost me anything, and was such an obvious choice. I changed a drink they had in the middle of the day and my eldest is suddenly not argumentative with me. I fully recommend everyone to read this book. If your kids are hyper, or just not able to listen to you it's probably NOT "just being a child". It's something in their diet, and it's not hard to fix. Even for myself, I suffer migraines needing hospitalization on occasion. They wreck my life. I've sorted most of my triggers, and this book helped me weed out the rest! My husband suffers from I.B.S, and my mum often feels just generally under the weather. This amazing book has helped so much. My mum is buying 2 copies for friends as she can see how diet really affects you. For such a great price (especially if you have Kindle) get this! There's some surprising things in there, not just avoiding certain additives in food. Other products like soaps contain things that can be absorbed, and yes these too affect us. Give this book a shot. You'll find something in here to help improve your general mood! I was a little unsure before purchasing this book as I had never heard of the author before. However, I am extremely impressed by the readability of the book and the advice that is given. I have certainly noticed a change in my own well being and no longer suffer from headaches after following the advice. Additionally my children seem far more relaxed and less confrontational now that I have followed the ideas relating to simple changes of food brand in in the book. I would highly recommend this book to anyone who is interested in trying to improve their own sense of well being or their children's behaviour. This is an excellent book. Informative and easy to read without any complicated jargon. 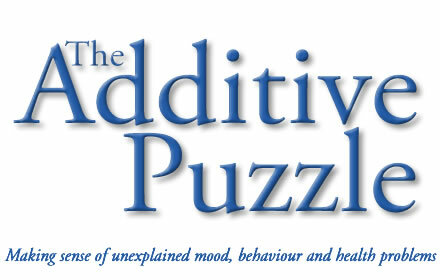 It explains a lot about personal behaviour around food and makes understanding of additives a lot simpler. Highly recommended.